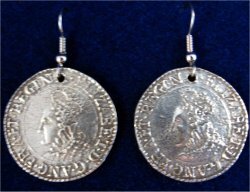 These earrings are made from reproductions of actual Elizabethan Shillings. A great finishing touch to your garb! Each piece is cast using lead free pewter. The coin itself is 1 1/16" [27mm] and comes on a surgical steel ear wire.